When a director and jewelry designer with two kids decided that they had outgrown their home, they also figured that it was time for an upgrade in more than just square footage. They wanted to raise their children in a place by the ocean, where an abundance of light and a modern aesthetic made for a casual, fun atmosphere. 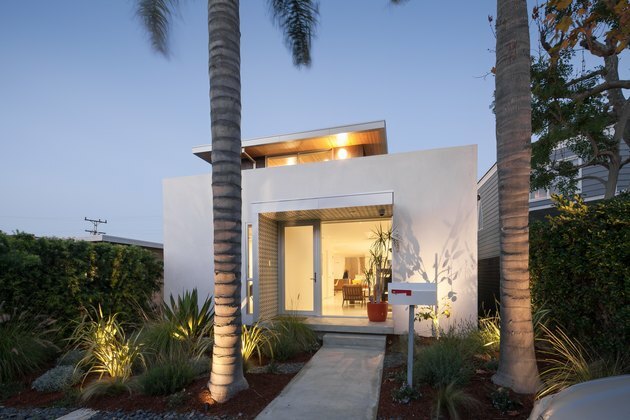 The pair found a one-story box on a cramped lot just blocks from the shore in Manhattan Beach, CA, which was an unfortunate style for an ideal location. So, they called on founding principal Robert Sweet and his studio ras-a, inc. to make some strategic adjustments. "This property and the surrounding lots are long and narrow, so the homes are densely grouped together with limited amounts of open space," Sweet said. "The house straddles a small alley in the back and a narrow street at the front." Sweet stuck to the existing footprint of the original address, but made room on the southern side for a private courtyard that seamlessly connects to the living area. He then thoughtfully placed windows and skylights where they would filter in the most sun, and filled the spaces with maple, walnut, and hemlock details for a warm yet laid-back finish. It's a four-bedroom oasis no family would want to outgrow, even when their dog, Charlie, is included. Smooth trowel stucco covers the front of the house, and features a glass entrance by Fleetwood Windows and Doors. 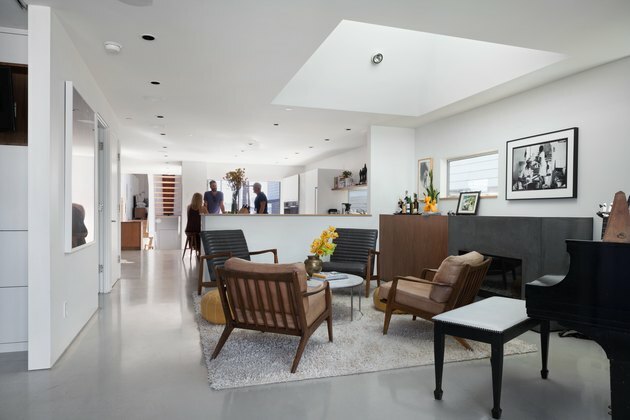 Polished concrete covers the full first floor of the home, including in the living room off the entrance. 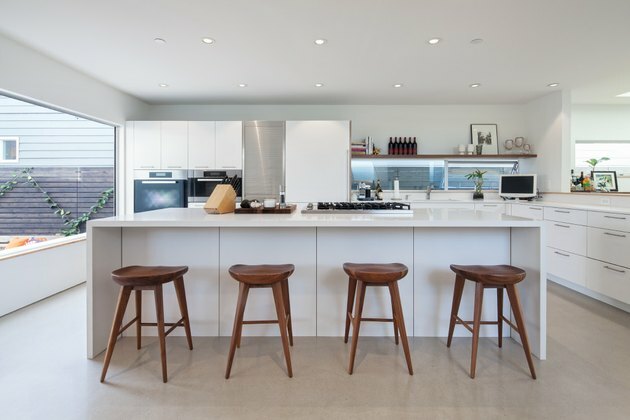 In the kitchen, Kami barstools by Nuevo Modern line up against a Caesarstone countertop. Europly cabinets with a laminate front fill out the rest of the kitchen. 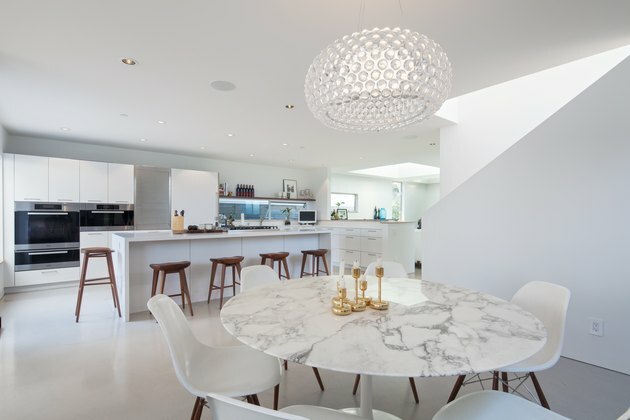 A marble Saarinen Tulip dining table is surrounded by Herman Miller Eames molded fiberglass side chairs in the dining area. The sunbrella fabric on the custom couch complements the accompanying Risom lounge chair and ottoman from Knoll. 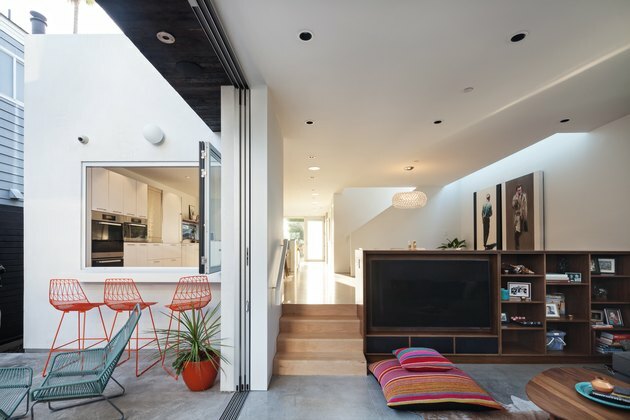 The living area opens to the private courtyard easily thanks to a disappearing sliding door. The orange Bend Wire barstools and counter overlook a window into the kitchen. Blue Ilan Dei Venice Cord Collection chairs match the orange ones at the kitchen's unofficial bar. 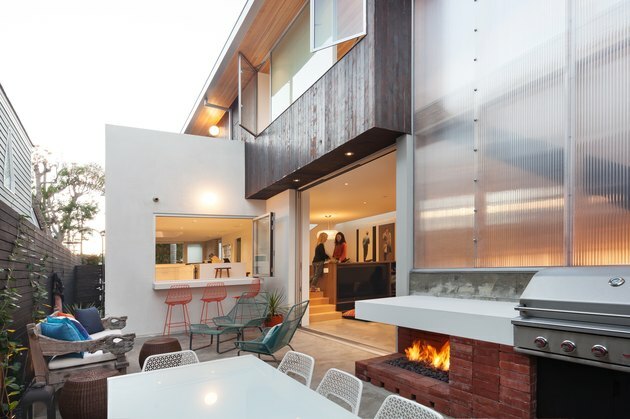 Sweet repurposed bricks from the original property's old patio into an outdoor fireplace and grill, and used charred cedar siding to foil the white stucco at the front of the exterior. 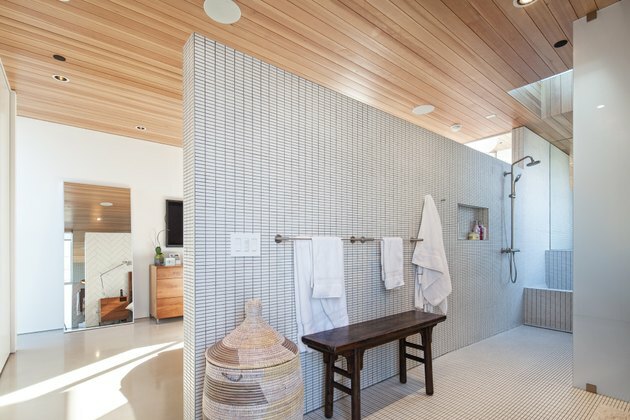 A tongue-and-groove hemlock wood ceiling connects the master bedroom to the bathroom. 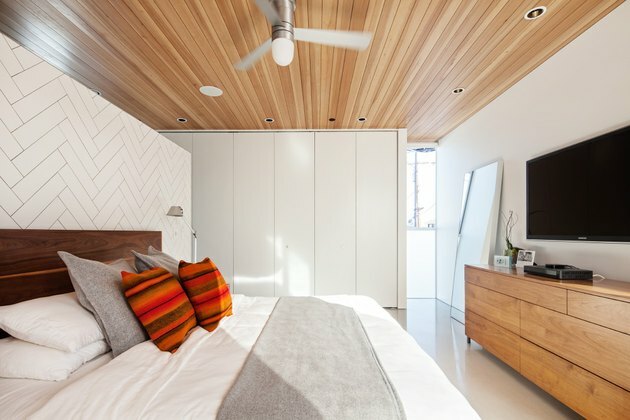 "Instead of compartmentalizing the master bedroom, bathroom, and wardrobe into separate rooms with full height walls, we used a low-wall partition to help blur the spaces while still separating their function — providing a spa-like feel," Sweet said. White ceramic herringbone tiles create that partition.